For other places with the same name, see Piedmont (disambiguation). Piedmont (Italian: Piemonte; Piedmontese: Piemont) is a region in the northwest of Italy, next to the border with France. The capital is Turin (Italian: Torino; Piedmontese: Turin), which was host to the 2006 Winter Olympic Games. Piedmont is surrounded on three sides by the Alps, including the Monviso, where the Po River rises, and the Monte Rosa. It borders with France, Switzerland and the Italian regions of Lombardy, Liguria, Emilia-Romagna and Aosta Valley. The area is justly famous for its wines, which include some of the best produced from Italy such as Barolo, Barbaresco, Barbera, Dolcetto and Moscato D'Asti, its local cuisine reknown throughout Italy and the precious white truffles of this region which have been compared to gold because of their cost and delicacy..
Langhe - in Cuneo Province to the south and west of the river Tanaro famous for its wines, and for its truffles. The hills of Langhe contain Piedmont's finest vineyards. The grapes grown in this region are primarily nebbiolo, dolcetto and barbera. The nebbiolo grape is used to make the renowned Piedmontese red wines Barolo and Barbaresco. Within Langhe are famous wine towns such as Barolo, La Morra, Monforte, Serralunga d'Alba and Barbaresco. Monferrato - extending from Turin to the eastern border of Alessandria, bounded by the Po River to the north and merging into Langhe in the south. The Monferrato is divided into northern and southern areas with Asti in the centre. This area is is also a well known wine area particularly for Barbera d'Asti, as well as less known varieties such as Fresia, Grignolino, Brachetto, Malavasia and Ruche di Castagnole Monferrato; it is also known for one of the rare white wines of the region: the Gavi. The Monferrato is also famous for its white truffles found in Autumn and celebrated in local festivals each Sunday. Roero - the hills situated on the west bank of Tanaro River between Alba and Asti. The sandier soil produces light Nebbiolo wines as well as Piedmont’s best white variety the Arneis. The area is also famous for its honey; there is a beekeeping trail you can walk, as well as peaches (check the local markets in summer and autumn). And then there is the Eco-museum of the Roero rocks, or the great path of the Roero a hiking trail stretching from Cisterna to Bra which incorporates the Roero rocks, ancient lime and sandstone cliffs. Alba - the entrance to the Langhe. Founded by the Romans, its historical centre still remains inside ancient Roman walls. Alba is best known for its elegant wines and exotic truffles as well as the home of Nutella Chocolate spread. Alessandria - city 90km southeast of Turin, the capital of Alessandria Province. Asti - center of the Piedmont wine area, an important medieval republic known as “City of 100 Towers”, of which around 15 still stand in the old historical walled city. The Palio di Asti, Italy's oldest Palio is held here every September in conjunction with the Douja D'Or wine festival and the Sagre Festival. Bra - city situated midway between Cuneo and Turin, on the edge of the Langhe near the Tanaro river. It is one of the main centres of the Piedmontese Baroque style with its many churches and palaces of the 17th and 18th century. Bra is also in the heart of the so-called food valley, and the seat of a University of Gastronomic Science. Stresa - a sophisticated small town on the western shore of Lake Maggiore. A health and tourist resort noted for its pleasant climate and scenic surroundings, it is a favourite site for congresses. A conference held there in 1935 between Italy, Great Britain, and France unsuccessfully attempted to deal with Adolf Hitler’s announcement that Germany would rearm despite the prohibitions contained in the Treaty of Versailles. Antonio Rosmini-Serbati, founder of the Institute of Charity (congregation of Rosminians), died there in 1855. Pop. (2006 est.) 5,103. Verbania - The main city of western Lake Maggiore. Population approx. 30,000. Here you will find pretty much everything you might be looking for. Plenty of shops and restaurants. A beautiful stroll along the lake. The Harbor where ships and ferry boats arrive and depart. Verbania also hosts one of the biggest farmers and apparel markets around the lake. One part of the city is called Pallanza. It's a very sophisticated area with some of the most spectacular Palaces right at the lake. Colletto Fava - the hill with the giant pink bunny. Lake Maggiore - Lake Maggiore, one of the largest of our peninsula, develops on a surface of 21 square kilometers, (13 square miles) long about 65 kilometers (40 miles) with a width between 1 to 4 kilometers, (.62 to 2,5 miles) located at 194 meters (636 feet) above sea level, with a maximum depth of 372 meters (1220 feet) (Ghiffa). Its shores cover a total lenght of 150 kilometers (93 miles) from Canton Ticino in Switzerland to Sesto Calende (Va), reaching with its waters two regions: Piedmont and Lombardy, and three provinces: Novara, Varese, Verbano Cusio Ossola. Wedged between the pre-alps, Lake Maggiore, of clear glacial origin, is framed in its lower section by the soft hills of the "Novarese" region, and in the upper section, by high mountain peeks, some of which with perennial snow. These features make it possible that in the costal areas the climate is temperate, milder in winter than in the inner areas and cooled down in summer by the breezes that blow on the water's surface changing its color. Thanks to its mild climate it was possible for many species of flowers and plants typical to the sub-tropical climate to adaptin the costal areas. The populations that inhabited Lake Maggiore were in the course of the centuries quite varied, from the Celts followed the Gaelic invasors, then barbarians and subsequently the Romans and finally governed by the lordships of the Visconti, Sforza and Borromeo. Commerce was the main activity, initially only by the lake, later by land due to the construction of the first section of the public road of the Sempione at the beginning of the XIX century. By the beginning of the 1900 with the launch of the Sempione railway commerce flourished along with tourism and hotels, these activities have protracted up to date. Native Piedmontese are friendly and down to earth. This region has been the industrial heart of Italy since 1800, even though nowadays it's experiencing some economic difficulties connected with deindustrialization. Tourism is a growing factor. The Monarchy has left strong heritage across the region, particularly in wide natural parks (former king's hunting reserves) and in XVIII and XIX century buildings. Piedmontese is spoken by about 2-3 million people throughout Piedmont. However, Italian dominates everyday communication. 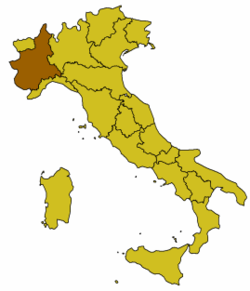 In 2004, Piedmontese was recognised as Piedmont's regional language by the regional parliament, although the Italian government does not recognise it. It has, however, been recognized as a separate language by the European Union. It is supposed to be taught to children in school, but this is happening only in a limited way. Piedmont is well served by airports. Caselle Airport (TRN)  in Turin is the main airport of Piedmont. It has regular flights with main European hubs and Italian cities operated by major airlines as well as low fares companies. The international hub is Malpensa (MXP)  which is the top Italian airport in terms of international traffic. It has direct connections with railway and highway networks. The airport is connected to Milan by the Milano-Varese highway as well by a dedicated train called "Malpensa Express". It is also connected to Linate Airport by a scheduled bus service. Linate Airport (LIN)  is the closest airport to Milan’s city centre and is well served by domestic and short-haul international carriers. It has easy access to the local highway network and is connected to Malpensa Airport by a scheduled bus service. Orio al Serio (BGY)  (Phone number: +39035326323) is located nearer to Bergamo and serves the low-cost traffic of Milan. To the south is Cristoforo Colombo Airport (GOA)  in Genoa which is served by domestic and short-haul international carriers. Another option is Levaldigi Airport (CUF)  in Cuneo, but it has a very limited number of flights and very few connections other than private car. from France, the Montgenèvre road (RN 94/ SS 24) from Briançon to Cesana Torinese in Italy is very good (above all on the italian side), always open during winter and free. Although some local bus and train service exists, the best way to tour the Piedmont is by car, especially for tourists who want to venture outside Turin and a few other large cities. The region has numerous interesting museums, some of the best are found in Turin including Museo Egizio, the second most important Egyptian museum in the world, and National Cinema Museum, most famed for the spectacular building. The Milky Way ski area is one of the biggest areas in Europe and encompasses the following resorts. Bardonecchia is another large ski area and was host to the 2006 Winter Olympic snowboarding events. Macugnaga and Alagna Val Sesia in the V.C.O. (Verbano, Cusio, Ossola) province (North-east of the Region). Limone Piemonte and Prato Nevoso in the province of Coni. If you can, try the Bollito Misto and Fritto Misto. These are two very traditional dishes and you may only be able to find them in old restaurants far from the tourist circuit. The Bollito Misto is a mix of beef and pork meat boiled with vegetables and eaten with a variety of sauces. The Fritto Misto Piemontese is a mixture of fried meats and vegetables. Another very typical meal is Bagna Cauda: it consists of a hot garlic sauce eaten with raw vegetables. Try also the "Panissa vercellese" a typical dish from Vercelli made with rice, beans and sausages. You can eat also fried frogs and good fishes from lake and rivers. Piedmont is well known for its great wines, particularly Barolo and Barbaresco but also Dolcetto, Arneis, Freisa, Gavi and others. Most vineyards are on the Langhe hills around Asti and Alba and on Monferrato other hills between Alba an Alessandria, but the passion for strong red wines has spread among the entire territory. Try also beers (Menabrea) and aromated wines (Vermuths). You will find many accommodations from bed & breakfast to superb hotels. A good place to stay is the Verbania area at Lake Maggiore. In Stresa you will find the most sophisticated hotels. Camping is also available. A good way to learn more about the area is staying at an agritourismo or a family oriented B&B. Piedmont is generally a very safe place. This page was last edited on 28 March 2019, at 15:17.